Situated between the Blue Ridge Mountains and the coastal plains, the picturesque rolling hills of Virginia’s Piedmont are home to many of Virginia’s top vineyard sites, wineries, and winemakers. Nearly half of Virginia’s 270 wineries are located in the Piedmont and a growing number of these wineries are led by women. Just two decades ago, the number of women winemakers in the region could be counted on one hand. Today, women account for roughly 20 percent of all winemakers or assistant winemakers in the Piedmont. The industry has a way to go to gender parity, but the demographics are changing fast. From winemakers to vineyard managers, viticulturists, oenologists, winery owners and tasting room staff, women are a driving force of Virginia’s Piedmont wine industry today. Katie DeSouza and Lucie Morton pose for a photo at Casanel Vineyards just outside the Town of Leesburg Virginia. In 1973, Lucie Morton planted her first vineyard, one of the first in the Piedmont region, on a three-acre plot at her family farm in King George County along the banks of the Potomac River. “I returned to our farm after finishing my undergraduate degree in History at the University of Pennsylvania and I wasn’t sure what professional route to take next,” explained Morton. After planting a mix of varieties in their vineyard, Morton saw that she needed more viticulture experience. What began as a trip to France to work the 1973 harvest in Bordeaux ended with her becoming the first American woman to attend the viticulture course at Ecole Nationale Supérieure Agronomique in Montpellier. Based in Charlottesville, Morton is recognized as one of the most renowned viticulturists and ampelographers (one who identifies grape varieties by their leaves) in the U.S. today. Last year, she was awarded the Virginia Lifetime Achievement Award by the Virginia Wineries Association and was recently named one of 100 “game changers” in the past 100 years of winegrowing in North America by Wines & Vines magazine. In the four decades since planting that first experimental vineyard on her family farm (named Morland Vineyard), she has helped establish some of the most notable vineyards in the region. In 1977, writer Felicia Warburg Rogan found herself picking grapes in Morland Vineyard with her husband, John, and their friends. Morton convinced the Rogans to try to make wine from the grapes. This initial experience led Rogan to plant grape vines on her farm in Charlottesville the following year and open Oakencroft Vineyard and Winery in 1983, Virginia’s seventh winery. Rogan went on to help establish what is known as the Monticello American Viticultural Area (AVA) and was named First Lady of Virginia Wine by then Gov. Gerald L. Baliles. In 1988, Juanita Swedenburg founded Swedenburg Estate Vineyard in the rolling hills of Middleburg (now the site of Greenhill Vineyards) after retiring from the Foreign Service. In 2005, the feisty Swedenburg won a landmark case in the U.S. Supreme Court (Swedenburg v. Kelly) to remove barriers that kept wineries from shipping directly to consumers in other states. Dr. Sudha Patil, owner and winemaker, poses for a photo at her Narmada Winery in Amissville Virginia. 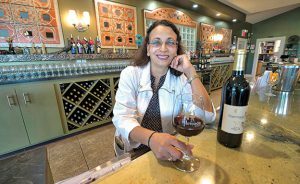 The same year the trailblazing Rogan retired and closed Oakencroft after serving the Virginia wine community for 25 years, Dr. Sudha Patil was going “all in” on her wine dream and beginning a new chapter of the Virginia wine story. Born and raised in a small town outside Mumbai, India, Dr. Patil moved to the U.S. more than forty years ago to pursue an education in dentistry followed by a three decade career as an endodontist. Dr. Patil and her late husband, Pandit Patil, fell in love with wine during their travels to Europe, which served as the catalyst for the couple to consider planting a vineyard and opening a winery when they retired. “We started visiting local wineries and learning as much as we could about grape growing and I took vineyard management and winemaking classes from Jim Law [winegrower at Linden Vineyards],” says Dr. Patil. On the way home from their anniversary dinner at the Inn at Little Washington in 1999, the couple happened to find a 51-acre plot of land for sale in the town of Amissville. The Patils purchased the property and began making plans for their vineyards and winery. The couple opened Narmada Winery (named for Pandit’s mother) the following year. Today, Dr. Patil manages twenty acres of vines at Narmada and produces about 3,000 cases of wine annually. Dr. Patil is among a group of accomplished women who built successful careers in the sciences before entering the local wine industry. Among this group is microbiologist turned wedding planner turned winemaker, Kirsty Harmon. Born in the Netherlands, Harmon grew up in Charlottesville and attended the University of Virginia, where she earned a degree in biology. “I wanted a break from microbiology so I became a wedding planner and planned a wedding for Patricia Kluge [founder of the former Kluge Estates Vineyard & Winery],” says Harmon. After working with Rausse for a couple of years, Harmon left the area to attend the University of California at Davis, where she earned her Master’s Degree in viticulture and oenology. In 2008, musician Dave Matthews hired Harmon to be the winemaker at Blenheim Vineyards, where she remains today and is one of the most respected winemakers in the Commonwealth. Dr. Joy Ting, who holds a doctorate in applied biology from the Georgia Institute of Technology and a certificate in winemaking from the University of California, Davis, landed her first job in the local wine industry with Michael Shaps Wineworks in 2013. Dr. Ting started as lab manager and was promoted to lead oenologist a year later and then served as winemaker for two years. In June 2018, the Virginia Winemakers Research Exchange — a state-funded research cooperative charged with enhancing wine quality and economic profitability — hired Dr. Ting as research oenologist and exchange coordinator. As one of the only full-time oenologists in the Commonwealth, Dr. Ting serves as a role model for women entering the industry. “Role models are important; it’s important for women to see other women in the roles they aspire to,” explained Dr. Ting. 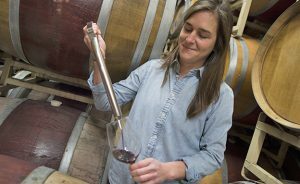 Emily Pelton, winemaker at Veritas Vineyard & Winery in the town of Afton, is one of three founding members of the Virginia Winemakers Research Exchange. Pelton is one of the growing number of second generation local winemakers. She completed a Master’s Degree in oenology at Virginia Tech and has been the winemaker at Veritas for more than a dozen vintages. The sweat equity of the early industry pioneers like Lucie Morton, Juanita Swedenburg, Felicia Warburg Rogan, and others paved the way for the next generation of women in Virginia wine. Among the most talented and experienced young winemakers in the region is Corry Craighill, who grew up in Lynchburg and attended the University of Virginia, where she earned a degree in religion and bioethics in 2011. “I was drawn to the wine industry through my love of travel,” says Craighill, who completed 12 vintages in just eight years, hopping across time zones and hemispheres, often working two harvests in one year. After stints in the vineyard and cellar at Blenheim and King Family Vineyards, Craighill took over winemaking at Sunset Hills Vineyards in Purcellville in 2016. Along with Craighill, Katie DeSouza is among the group of talented young women winegrowers writing the next chapter of Virginia’s wine story. 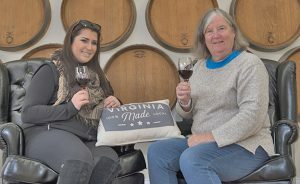 After earning a degree in English from Virginia Tech in 2009, DeSouza returned to Leesburg to work at Casanel, the winery established by her parents in 2006. As one of youngest winemakers in the region, she has experienced gender and age challenges. “Because I am considerably younger and a female, it was difficult in the beginning to make my voice heard when challenged by my older male peers,” shared DeSouza. Corry Craighill, the winemaker at Sunset Hills & 50 West Vineyards, tests some red wine in the storage area at the vineyards. DeSouza’s early experiences highlight the importance of mentors like Morton and Katell Giraud, who provided winemaking guidance at Casanel. Giraud grew up in southwest France where her family owns a winery in the Monbazillac region. Following a degree in agronomy, she went on to earn a Diplôme National d’Oenologie (National Diploma of Oenology) from the University of Bordeaux and a second master’s degree, Oenologie et Environnement Viti-Vinicole (oenology with specialization in environment). After working several harvests in France and New Zealand, she came to Virginia in early 2009 to be the still winemaker at the former Kluge Estate Winery & Vineyard before taking on the role at Casanel. Today Giraud is the winemaker at Slater Run Vineyards in Upperville. Other women contributing to the region’s rise in stature and wine quality include Jean Case, the former AOL executive who purchased Early Mountain Vineyards (formerly Sweely Estate Winery) in 2011. Of the many notable contributions Case has made to the industry since buying the winery, hiring talented wine professionals like Maya Hood White may be the most important. Born in California, Hood White studied math as an undergrad and then earned a Master’s Degree in viticulture and enology from the University of California, Davis. She joined the Early Mountain Vineyards team in 2014 as associate winemaker and viticulturist. As the first local winemaker to produce pétillant-naturel (Pét-Nat for short) wines for commercial sale, she brought new techniques and a fresh perspective with her to Virginia. “Generally, I think the Virginia wine industry is quite welcoming to women. Perhaps, being such a young industry, there are fewer preconceived notions as to the types of people who make wine and people finding their way into the industry from such different paths,” says Hood White. Jenni McCloud, who founded Chrysalis Vineyards in Middleburg two decades ago, is known globally as a champion of Virginia’s native grape, Norton. With 40 acres under vine, McCloud farms the largest planting of Norton in the world. Elizabeth Smith jumped in to the Virginia wine industry in 2009 when she and her husband Tony purchased Afton Mountain Vineyards. Smith serves as general manager of the winery overseeing all phases of the operation. Not all of the women contributing to the local wine industry are in the cellar making wine. Leanne Wiberg, a naturalist and geologist at NOVA Parks by day, provides wine and history education tours at Fleetwood Farm Winery in Leesburg. Other women driving the growth of the local industry include Annette Ringwood Boyd, director of the Virginia Wine Marketing Office; Jennifer Breaux, vice president, Breaux Vineyards in Purcellville; Patricia Kluge, who poured a fortune in to building Kluge Estate Winery & Vineyard in Charlottesville, bringing much-needed attention to the local wine industry in the early 2000s; Aimee Henkle, co-owner of The Vineyards & Winery at Lost Creek; Melanie Natoli, winemaker at Cana Vineyards and Winery of Middleburg; Maggie Malick, owner and winemaker at Maggie Malick Wine Caves in Purcellville; and Mimi Adams, assistant winemaker at RdV Vineyards in Delaplane, among others. The future of wine in Virginia’s Piedmont is brighter because of the dedication and expertise of these exceptional scientists, winemakers, oenologists, winery owners, and viticulturists leading the way.